A succession of weather fronts pushing into South Florida has resulted in an increase of Sailfish in our Ft Lauderdale fishing area. These frontal systems while bringing some showers that we could do without have gotten the Sailfish moving. Clean water all the way to what seems like the beach as of late. A strong northerly current and couple those two with some wind out of the north, which we have, and sails are up and surfing their way south. Tailers being seen and fished in water from 75 to 150 of depth. We have been blessed with a lot of sun around those scattered showers and when that sun is out these fish are very visible. Mostly good sized adult fish this time of year. These conditions won?t last for long and being on the back side of peak Sailfish season we are happy to have this happening right out front of our inlet. Live bait is as expected the key to success when these fish are moving like this. Many will bite but some will refuse with the barometric situation early on these fronts. Some fish seem as if in a trance and although they color up when they see the bait will move on. But but some take that look and then bite as well. Measured taking of the bait, few crash bites, and then they resume that southern direction only to often turn up sea and north when hooked. 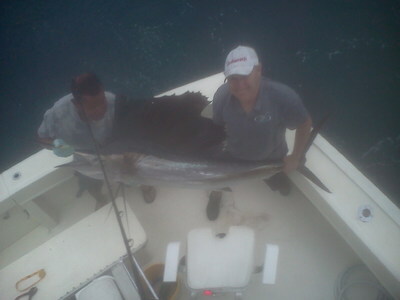 Nice fish pictured with Bob and 1st Mate Dave aboard Marlin My Darlin prior to release. Good fun and memories. We will catch them all year but Sailfish catches taper off as we move into Spring and summer. There continue to be some Kings and scattered Blackfin Tuna. Mahi-Mahi always a possibility with almost all of legal size, but in smaller sized schools. Large tight schools of fat Bonito hauling the mail south. Multiple bites when you get in front of them, none if you miss them by 100 feet. Mutton Snappers on the reef and wrecks and some Jacks on the deeper wrecks as well. Very large Sharks (high season for them).